Right now, I am wrapping up a writing project that God put on my heart. Finishing a manuscript is a lot of frustration and a lot of fun. In a couple days, it will be time to begin my favorite part: going back to page one and reading through everything I have written, tweaking and rearranging and deleting. I have written four manuscripts in my lifetime. Twelve Clean Pages (2011) was self-published, Hunting Hope (2016) and Everyday Genesis (2017) were traditionally published, and one finished manuscript has not been published at all … yet. The one I am now finishing will be my fifth. Yet, this project is different from any other writing project I have done because it is fiction. I have always wanted to write fiction, but I never have because it scared me. When I say I have always wanted to write fiction, I mean ALWAYS. My earliest writing memories are of me at 10 years old, sitting at a typewriter in my bedroom, inventing stories about the high jinks of Texas teenagers who go on a school field trip to London, England. And another one about a girl who moves from Mississippi to Fort Worth and doesn’t get a chance to make friends because she catches a deadly case of the measles. Then, a few months ago, I got this text. 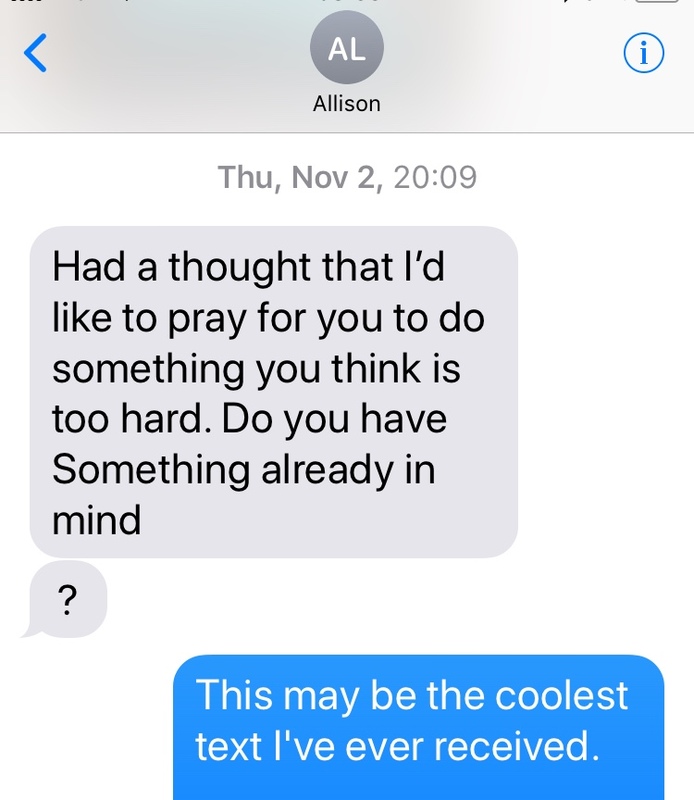 My reply was something along the lines of: That’s a cool thing to ask, and all, but I’m not really afraid of anything, so I’d have to think long and hard to try to figure out something for you to pray for. How about I sleep on it and tell you tomorrow? And when I hit send on that text, God replied in my heart before Allison had a chance to reply in my phone: You’re afraid of fiction. So I wrote back right away and told her I was scared to write fiction. As I typed it to her, my upper lip started to sweat. I shivered with cold chills. My heart raced. I felt nauseated. Even texting the word fiction made me afraid. But in giving that answer to Allison, I was facing my fear for the first time, and if that was the shaky place I had to start, then so be it. 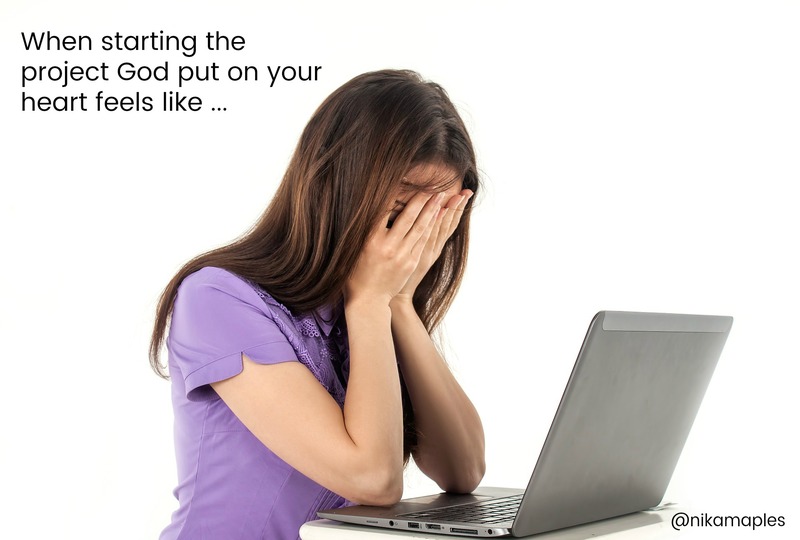 I tell you that story to let you know I understand what you are feeling if God has put a project on your heart that scares you out of your mind. And I came across two verses this morning that you just have to see. I believe they skate together gracefully. Here is the first verse: “All of us must quickly carry out the tasks assigned to us by the One who sent Me, because there is little time left before the night falls and all work comes to an end” John 9:4. “The Red Sea saw them coming and hurried out of their way! What’s wrong, Red Sea, that made you hurry out of their way? Why, mountains, did you skip like rams? Obviously, in the first verse Jesus is saying we need to quit wasting time and get after it because we aren’t going to be here much longer. You can read that verse and still feel afraid. You can know that you need to start a project and still see nothing but obstacles between you and finishing it. That is why I love the second verse. When God’s people were on their way to the Promised Land, they became terrified about all the obstacles on their journey. But they didn’t have to be afraid! When they approached the obstacle of a sea, the sea hurried out of their way. When they approached the obstacle of a river, the river retreated. When they approached the obstacles of mountains and hills, both of them skipped away! Nothing was left in the Israelite’s path. Nothing was going to stand between the people and the promise. Your project may be writing a book. It may be starting a business. It may be homeschooling your kids for the first time. It may be applying for a job that feels beyond you. Go ahead! Approach that obstacle and watch it move! Nothing is going to stand between you and the promise. That is what I am declaring over you today because I know it has been true for me. In only five months, I have completed a project that I spent 35 years avoiding. And why did I finally begin? Because a friend dared me to. And she prayed that God would provide all I need along the way.